Having been quilting over many years I have come to realize that good quality fabrics are usually found in Local Quilt shops.. I don’t mean to knock Fabricland and other chains like that, but I now barely ever purchase fabrics from them as they are not as good of a quality as the local quilt shops. Sure they were good enough when I was just learning to quilt but they sure are not now. I have a quilt that I made over 20 years ago with fabrics from many different fabric sources. 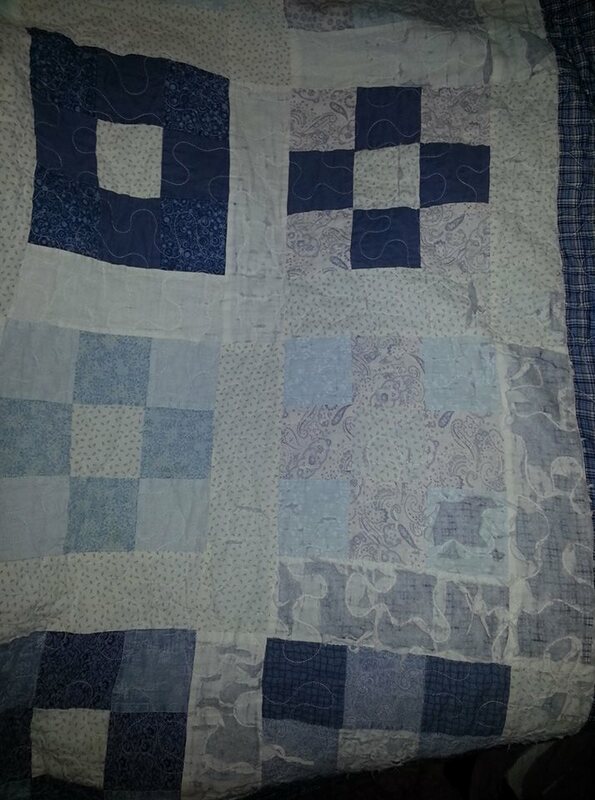 I was just after blue and white material to make a 9 patch quilt. Some of the fabrics that I were used were not good fabrics and they have has broken down and ripped over many washings where the good fabric Is till in good shape. Once I got to know the differences I can actually feel the good fabric is silkier, and when held up to the light is not as translucent as the cheaper stuff. I try to tell all my newby quilting freinds this but most learn on their own. Surfing today I found this good article from Keepsake Quilting on the difference between good and not so good fabrics its worth the read.The Difference Between Chain Store Fabrics and Quilter’s Grade Fabrics. Click on name to get to article. Next Sandwich…not food. The process of layering a quilt.